Strait Shipping link the North and South Islands of New Zealand, handling over 50% of the sea born freight between the busy ports of Wellington and Picton. A major aspect of Strait Shipping choosing Ferry Plus was our proven ability to work with customers to tailor the flexible solution to their exact needs. For Strait Shipping this has included quickly adapting pricing, reporting modules and interfaces to the main Strait Shipping systems ensuring that the application is fully integrated into their business providing seamless back and front office functionality. In 2013 Strait Shipping identified a major need to improve the accuracy of their freight operation. 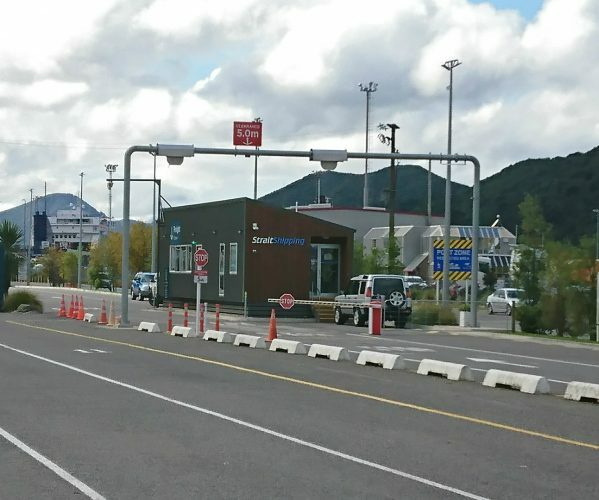 The misreporting of vehicle dimensions when a trailer of different length arrived than was booked, was causing issues in ferry loading, and substantial increased back office costs in reassigning and rebilling their customers. Indeed, an interim manual solution of a man with a measuring wheel was more than ample proof that a better answer was needed. Strait Shipping’s solution was to ask a local company to construct a weighbridge with a difference. Apart from the usual weighing of the axles to calculate the overall vehicle weight, the platform also uses lasers to measure height, length and width of both vehicles and trailers. It also incorporates a trailer number plate recognition system in order that trailer numbers link to the freight shippers so provide a better billing system than haulier vehicle number. Finally, a photo of the trailer condition is taken, ensuring that any questions over damage, allegedly caused during shipping, can be quickly resolved. But all that technology would be wasted without fully integrating into both booking and accounting systems. So Ferry Plus worked closely with the Weighbridge manufacturer to build an API which takes the registration number, trailer image, and all weights and dimensions and feeds them into the Ferry Plus application. Where details of vehicle and or trailers arriving at the weighbridge differ from the booking details, a new consignment note is automatically printed for the driver. Additionally, the API updates the booking, amends the price (where applicable), issues a corrected invoice direct to the customer and updates the company accounting system. For Strait Shipping this means automatic fast, accurate and seamless booking loading and invoicing, both reducing costs and improving profitability. For their customers, it means that last minute changes to cargo or trailer are automatically dealt with without the need to re-book, meaning the customer pays only for what they send. And of course, for Ferry Plus it means a satisfied customer, able to grow their business on the back of great reservation software – powerful, flexible, scalable and able to be tailored to meet all situations.